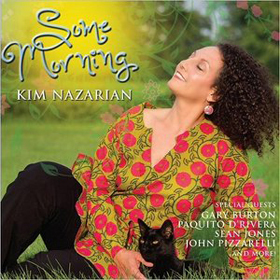 Kim Nazarian was firmly enough established as one of the stellar New York Voices and now with this gorgeous solo album, Some Morning she well on the way to the rarefied realm reserved for musicians of exceptional genius. She is an entirely distinctive figure, musically bold and with an astonishing ability to modulate and vary her melodic patterns. There is something so singular and warmly compassionate about this music, which positively glows with its soaring, beautifully arched melodic lines sung by an extremely fresh voice. Kim Nazarian is well served as she is accompanied by the dynamic playing of an incredible cast of musicians including Paquito D’Rivera, John Pizzarelli, Gary Burton and the record’s producer and arranger-in-chief Jay Ashby. It’s a pity this record did not happen sooner. The high-velocity singing of Kim Nazarian jazzy bel canto repertoire – as bel canto as jazzy can be – constantly reveals her intelligent balance between vocal legato and word articulation, as well as her slightly grainy warmth of tone that’s particularly welcome amid the astringency that has set into the coloratura technique of her singing of lyrics especially in the ensemble of the New York Voices where she is one of the greatest vocal assets. But these moments apart, Kim Nazarian is a rich-toned soprano without a hint of a wobble, who can evoke exactly the lyrical drama that a song such as What’ll I Do, for instance, demands. But that’s just one example. On the whole her singing is radiant in its glowing simplicity. This is a recording noted also for the exciting arrangements played by exceptional musicians playing the resonantly scored accompaniment that is essentially lyrical and full of yearning. Both Ms Nazarian as well as the musicians accompanying her tends to achieve a rich width of expressive sonorities. And even though this is at times seems like an ensemble cast playing the music, make no mistake, the character is all Kim Nazarian. Sure, she sings wonderfully scripted music but the fascinating distinguishing details are all hers. Listen to how she turns Steve Wonder’s If It’s Magic into a vocalastic reconstruction all her own. Ms Nazarian does likewise with the perennial family favourite Que Sera, Sera, twisting the rhythmic bassline with poised agility into something all her own. Kim Nazarian’s unguarded emotionalism is on display here and she sashays through the repertoire without getting bogged down in sentimentality. Her slow music is profoundly beautiful and calls to mind dancers leaping and pirouetting through their routine with memorable balletic grace. Sometimes her gentle vibrato at the top of her voice brings a touching vulnerability to her interpretations of the music and where the programme demands more Ms Nazarian is simply up to the task, turning up the heat just that extra notch yet maintaining her meticulous grace and the pointillism of her skill and colour. Some Morning is guaranteed to bring a parade of admirers Kim Nazarian’s way. Her spiky brilliance is what will cause this wave of followers to come her way as she continues to take imaginative flights of fantasy into and out of music that is both recognisable as well as not-so-recognisable; either way she will bring a certain vividness to whatever she touches much in the same way as a proverbial Midas-like artist of today and the future. Track List: Robbin’s Nest/Boneology; Tell Him I Said Hello; Gotta Be This Or That; All In My Heart; What’ll I Do; Still Life; Some Morning; So In Love; If It’s Magic; Que Sera, Sera; Road To Kursk. Personnel: Kim Nazarian: vocals; John Pizzarelli: guitar and vocals (2); Ian Ashby: vocals (10); Barbara Bürkle: background vocals (4); Mark Soskin: piano (1, 3, 10, 11); Mark Shilansky: piano (2, 4, 5, 7, 8, 9); Alon Yavnai: piano (6); Gary Burton: vibraphone (7); Caitlin Merhtens: harp (8); Dwayne Dolphin: bass (1, 3, 7, 9, 10, 11); Leo Traversa: bass (2, 4, 5, 8); Roger Humphries: drums (1, 3, 10, 11); Jamey Haddad: drums (2, 4, 7, 8), percussion (7, 8, 9); Marty Ashby: guitar (1, 2, 8); Jiro Yoshida: guitar (4); Mike Tomaro: saxophones (1, 11); Greg Nazarian: saxophone (10); Alexa Still: flute (2); Paquito D’Rivera: clarinet (2); Anna Nelson: clarinet (2); Jesse McCandless: bass clarinet (2); Jay Ashby: trombones (1, 5, 10, 11), percussion (4, 7, 9), kalimba (9), background vocals (9); Sean Jones: trumpet (1, 11); Steve Hawk: trumpet (1, 11). 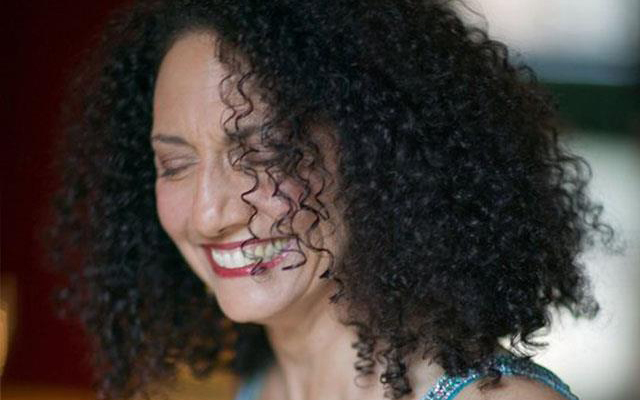 Some Morning is the first solo release by Grammy- nominated artist Kim Nazarian. Well-known to jazz fans around the world as a founding member of New York Voices, Kim is one of the most accomplished vocalists on the scene today. This project highlights Kim’s talents not only as a singer, but also as a lyricist and an arranger.